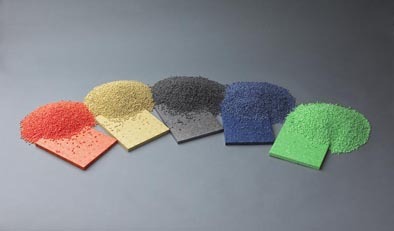 Expanded Polypropylene (EPP) is a highly versatile closed-cell bead foam that provides a unique range of properties, including outstanding energy absorption, multiple impact resistance, thermal insulation, buoyancy, water and chemical resistance, exceptionally high strength to weight ratio and 100% recyclability. EPP can be made in a wide range of densities, from 15 to 200 grams per litre, which are transformed by moulding into densities ranging from 18 to 260 grams per litre. Individual beads are fused into final product form by the steamchest moulding process resulting in a strong and lightweight shape. The manufacturing process is complex, requiring both technical expertise and specialised custom equipment. 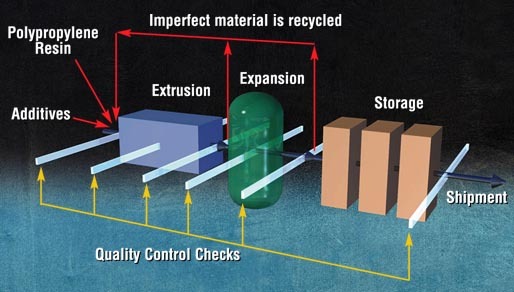 Polypropylene resin is combined with other ingredients in a multi-step proprietary process. Under tightly controlled conditions, extruded pellets expand to become consistently shaped beads of expanded polypropylene foam. Other specialised manufacturing techniques may be employed to produce variations in the final product form. EPP foam beads are then injected into molds. In many cases, cost-effective multi-cavity aluminum molds are used. Pressure and steam heat fuse the beads into a finished shape. The finished EPP foam part becomes a key component in sub-assemblies incorporated in the original equipment manufacturer’s product. EPP is available in grades necessary for a wide range of applications, based on the technical requirements. High density grades are used where energy management is important, such as automotive bumpers and interior passenger safety components. Low density grades are used for packaging applications, and medium densities find applications in furniture and other consumer products. Low Emission grades minimise outgassing of VOCs for automotive interior parts. Anti-static, dissipative and conductive grades, typically used for special packaging requirements, are available. Porous EPP is comprised of cylinder-shaped polypropylene beads, which adds air space between the beads in the final moulded form, which enhances beneficial acoustical insulating effects and reduces weight. EPP is commonly coloured black for automotive applications, though is often found in white for packaging products. EPP is available from some suppliers in vibrant colours suitable for presentation-grade textured surface. EPP is widely utilised by automotive manufacturers because of its performance benefits for energy management, lightweight, enhanced functionality, durability and recyclability. Applications include seating, bumpers, stowage systems, door panels, pillars, floor levelers, parcel shelves, head rests, tool kits, sun visors and myriad filler parts. Reusable industrial packaging, known as dunnage, is frequently made from EPP due to its durability and its inherent ability to absorb energy in transit. EPP is used increasingly in furniture, toys such as model aircraft and other consumer products due to its versatility as a structural material and its light weight, as well as other performance characteristics. ARPRO® EPP beads are available in a wide range of densities with technology for coloring also available. EPP is approved for use in conjunction with food products. Its thermal insulation properties and structural strength make it appropriate for containers such as food delivery containers and beverage coolers and the like. EPP does not support microbial growth and can be made sterile with steam cleaning. EPP was first developed in the 1970's by JSP, as a result of research into new forms of polypropylene. The material's first applications were for automotive products in Japan in 1982. Demand for EPP has since increased dramatically in all regions of the world based partly on the need of auto makers to improve energy management functions whilst reducing weight and improving environmental benefits. The first automotive application for EPP was for an energy absorbing component in a bumper system. EPP is now widely utilised for numerous other automotive parts and systems, including seating and other interior components.